The workshop will be dedicated to the discussion of the future tau-charm factory projects. The physics case will be revisited via joint theory and experiment contributions, together with detailed discussions on the required accelerator and detector design. The two existing proposals – the one in Novosibirsk and the one in Hefei – will give a base for discussions. 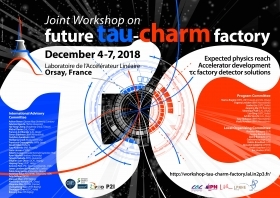 The first day of the workshop will be dedicated to expected physics reach, the second day to the accelerator discussions, while the third day to the detector for the future tau-charm factory.The fourth day will be dedicated to summaries and a discussion of potential synergies between the two projects. A poster session will be organised during the welcome reception in the evening of December 4.The posters will remain exposed until December 7 in the midday to facilitate further discussions. Is there any Physics from 5 to 7 GeV ? Conceptual design and R&D progress"